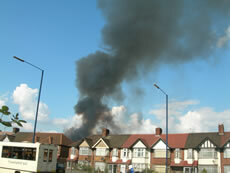 A huge column of smoke was clearly visible from miles away as a warehouse in Park Royal blazed this afternoon. 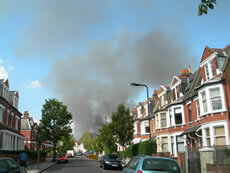 The smoke was visible from all over London - people reported that it could be seen in Chiswick and further afield in Central London. Police stopped the traffic from proceeding down Park Royal Road at the junction from Horn Lane which is causing some congestion in the area. It is not known currently what was housed at the warehouse, but we will keep you informed. In the mean time here are some pictures taken from close to the scene. 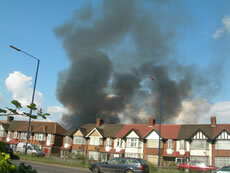 Scores of firefighters are tackling the blaze which is close to a cemetary and to North Acton station. There are small explosions audible from quite a distance away. Residents would be well advised to shut all windows as the smoke spreads. The Environment Agency have set up a 200m exclusion zone while they ascertain whether the smoke contains any noxious substances.